On the counter, in the cabinets and closets, and in every nook and cranny… clutter can take over your house and your life. People have a lot of stuff. You could argue that people have too much stuff, and that moving to a larger house is the answer. However, when people do move to larger houses, they usually get even more stuff. 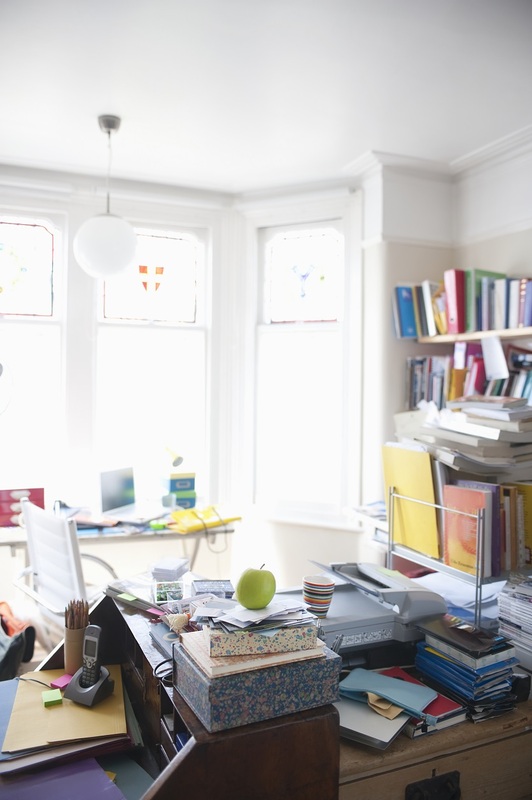 Lack of space is not the reason for most clutter. Instead, it is a lack of organization that creates the jumble of stuff in your home. You might have heard the phrase, “A place for everything, and everything in its place.” That is the ultimate mantra for getting rid of clutter. These top five tips will help you do it. Position your mail center directly next to your garbage and recycling bins. When you bring the mail in from the mailbox, do not just lay it on the counter. Immediately leaf through the pile and throw out or recycle and junk mail and unwanted magazines and catalogs. DVD and video movies, music CDs, and books can create a lot of clutter and take up a lot of room. You can store these most efficiently with various shelves and racks that are created just for them. Some DVD and CD racks can even be hung right on the wall. Wide-open flat spaces like counters and tabletops are one of the first places that are covered in clutter. In order to reduce this countertop clutter, use containers for various items. Your car keys can be hung on a rack; purses or backpacks should have a peg on the wall or fit underneath the counter, or should be brought into bedrooms. In the kitchen, bins for coffee, tea, sugar, and other ingredients will look much less cluttered than individual containers. To reduce clutter everywhere in your home, make the most of the closet space you do have. Rather than just using them to hang hangers and shove a few things on the high shelf, you could try utilizing closet bins and racks of varying sizes. The more you fit into your closets, the less cluttered your house will seem. Garages and sheds attract clutter in their own way. Besides organizational shelving or bins, you should be able to make room for various other items that would otherwise sit in your house. Here, where the look of the place is less important than the use, organizing clutter is easier. Walls can be covered with hooks and shelves. Even the ceiling can have hooks or pulleys that will hold items for you. Living with clutter makes many things more difficult: cleaning and housework, finding the things you need, and even leads to wasting money. With these five easy tips, you will be able to get rid of clutter in your home. Maximizing the space that you have, and minimizing the stuff that you have to put into it is the way to go.